Although the party was several weeks ago, little Tess, who turned six while we were in Aruba, had asked me for a chocolate cake with chocolate frosting with her and her best friend Shelby, holding hands and holding flowers. She'd told me Shelby had brown hair that was down to her shoulder and brown eyes. Tess is strawberry blonde. I even tried to give their arms some muscle...LOL!!! Cute, huh? 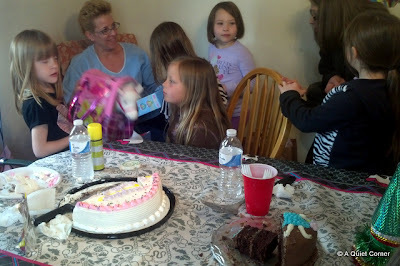 I think the best part was when one of her other six year friends looked up at me and said, "Next year, can I be on the cake too?" They killed the cake leaving less than 1/4, so to me that meant it tasted great too!!!! All that was left was part of Shelby!!!! Fantastic job on the cake. Soon you'll be able to go into business. if i were there you would have had much less cake left. 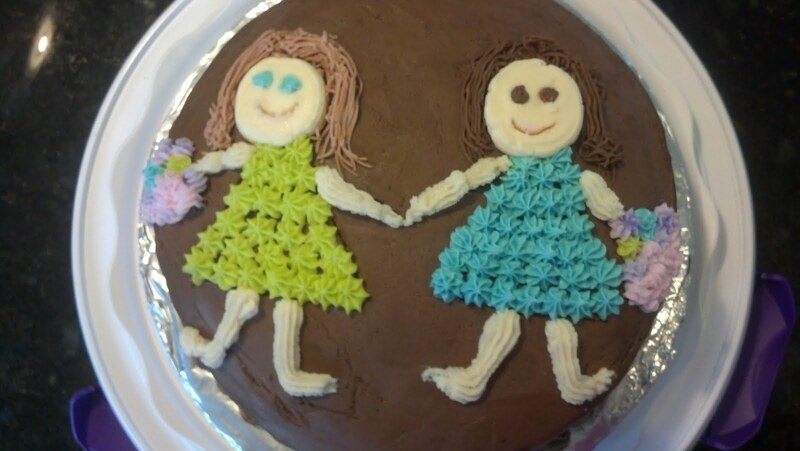 really cute cake for to really cute girls. What a cut cake! I know the girls loved it. That's some cake you made!! No wonder they all wanted to be on next year's.